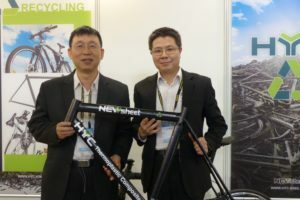 LUXEMBOURG – The new anti-dumping duties for China and Vietnam that came into force July 14, 2005 in combination with the enlargement of the EU in 2004 with new member states in Eastern Europe, has led to a major shift on the European bike market. It halted the ever-growing import of bicycles from Asia, as Europe is turning to Eastern Europe as a major supply base for bikes. The shift from Asia towards Eastern Europe is best illustrated with two figures; an 18.4% growth in the import of bicycles towards the ‘old’ EU with 15 member states from the new member states, versus a 4.8% drop in import from Asian countries. This is what happened in 2005 and is indicated by the statistics from the EU customs data bureau Eurostat. It’s beyond any doubt that this trend will continue in the years to come and that Eastern Europe is developing into a production base for bikes. Production and consumption in 2005 stayed at about the same level as in 2004 in the ‘old’ EU-15. Such figures are not available for all new member states. Due to that lack of information, there have always been doubts on the total bike market volume for the EU with its current 25 member states. In this article we’ll dig deeper and come to the conclusion that for the whole of Europe bike sales are higher than most industry insiders would estimate. All EU-25 member states imported in 2005 16.5 million bikes; about 700,000 more than in 2004 which comes down to a plus of 4.3%. Eurostat statistics for that import specify two categories; ‘intra’ EU which is one EU member state importing from another EU country and ‘extra’ EU: importing bikes from outside the European Union. Still the ‘extra’ import is bigger than the ‘intra’ with 9.1 million bikes coming from outside Europe and 7.4 million from other EU countries. However, ‘intra’ is on the rise and in a big way. In just two years the ‘intra’ import increased with 68.7% and around 3 million units to the current 7.4 million. In 2005 45% of the total bike import in Europe originated from other EU countries. As said, the Eastern European countries are on the rise with their bike export. In 2005 Poland was the biggest exporting country of all Eastern European member states with a total 2005 (intra) export of 930,000 units. Lithuania is the runner up country with 360,000 units and the Czech Republic comes in 3rd place with 162,000 units. Bulgaria, which will join the EU from January 1, 2007, is also an exporting country to be reckoned with. It exported about 275,000 bikes last year to the EU countries. A closer look at what happens in the new Eastern European member states, and in particular at their 2005 bike imports, reveals some striking facts: Their entry into the EU had direct consequences for their bike imports from outside the EU (read: China and Vietnam). In Poland for example, that import dropped with about 50% (!) from 630,000 units in 2004 to 315,000 in 2005. Exactly the same happened in other new Eastern European member states like Slovakia, Lithuania, Czech Republic and Hungary. Also in these countries the import from outside the EU (China and Vietnam) dropped by about 50%. This clearly indicates that before the new anti-dumping measures for China and Vietnam came into force on July 14, 2005, the Eastern European new member states imported and re-exported lots on bikes from the named Asian countries to other European countries. The new member states were not the only ones circumventing the new anti-dumping duties for China and Vietnam. The same happened in Belgium where in 2005 bike import from China rose with 90% to 347,000 units and from Vietnam more than doubled to 150,000 bikes. The total bike import into Belgium from outside the EU also almost doubled in 2005 to a total of over 1.1 million units. Bike Europe’s correspondent in Belgium, Annick Roetynck wrote in her 2005 Market Report for the country, that it is expected that in the next few years Belgian imports will be forced further up because of Decathlon. The French sporting goods chain has built a brand-new, 35,000 m² European logistics centre in Willebroek near Antwerp. From there, bikes will be dispatched to the outlets in all neighbouring countries. Not Belgium but the UK is Europe’s biggest bike importer. A total of 3.25 million bikes were imported into the United Kingdom; over 3 million came from outside the European Union. In the 2003 – 2005 period the total import of bicycles in the EU 25 rose with 2.6 million units (18.9%) to a total of 16.5 million units. One should expect that such growth, in particular the rise in imports from the new Eastern European member states, must leave its mark on the statistics for the production of bicycles in the ‘old’ EU 15. Especially when taking into account that bike production in England has been almost completely ceased and the production shifts of companies like Hercules and Tunturi to Hungary. Next to that, other bike makers just went belly up like United in Belgium or Merkers Rad in Germany. All such developments are not expressed in the 2005 production figures. 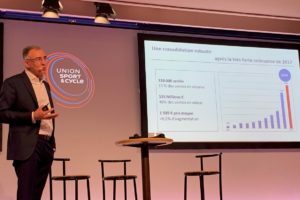 According to the national associations, united in COLIBI (Comité de Liaison des Fabricants Européens de Bicyclettes or committee for European bike makers) combined with estimates for countries that don’t have such associations, production reached 10,322,000 bicycles. That number is just 0.4% down on the 2004 production total. There’s one country where the production rose in 2005 with big numbers. More than that even; it doubled in Portugal to about 1.2 million units. Reason for that remarkable growth is in the relocation of the production by a couple of Spanish producers. However, one would expect to see some effects in the 2005 production numbers for Spain. But the fact that these effects are not shown has to do with the Spanish association for bicycle manufacturers SEEB that could not present its production figures for the whole year. But the SEEB production figures up to August 2005 indicate at a production level that was about the same as in 2004. Germany is still Europe’s number one in the production of bicycles. However, numbers are slipping from 3.2 million in 2003 to 2.7 million in 2005. For 2006 a production below the 2.5 million mark is to be expected. Italy is still the production runner up, but could well be turning into the number one position as production in Germany is dropping further. France comes in third with about 1.7 million units. 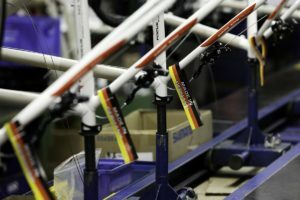 Here too production is under pressure as more and more French bike manufacturers are stopping their business with supermarket chains like Carrefour, Casino or Intermarché. Due to ‘price madness’ as this trade journal reported in its September 2006 edition, there’s no more money to be made with supermarket bicycles for most of the French bike makers. 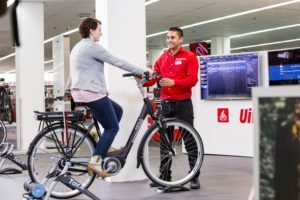 Dutch Accell Group announced that its French subsidiary, Cycles Mercier that is targeted to the supermarket business, is to cease its production. Bike ‘consumption’ (stands for deliveries to dealers) levelled of in 2005 after a substantial growth in 2004 of 7.9%. A total of 18,444,000 bicycles were ‘sold’ in 2005 in the ‘old’ EU-15, slightly up on the 18,190,000 of 2004. The national associations united in COLIBI accounted for these figures. In the countries without such associations estimates were made by local industry insiders as well as Bike Europe’s correspondents. No big changes took place last year on bike sales in the old EU member states. Germany is still by far the biggest bicycle buyer in Europe. With its population of 85 million it is Europe’s biggest country and economy. France is runner up, closely followed by the UK. Bike consumption in England is now calculated at 3.3 million units (by the Bicycle Association of Great Britain) after discussions on a much higher consumption figure of 4.5 million units that was published by this trade journal in an article in the November 2005 edition. Italy comes as always in 4th position with a 2005 consumption of close to 1.9 million units. Holland ranks number 5 with over 1.2 million bikes sold in 2005 but should be on top of the list looking at the population of only 16 million. Per head of the population Holland is the Nr. 1 bike seller in Europe and maybe even in worldwide! 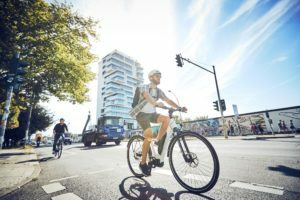 One Million E-Bikes Sold in Germany in 2018; Up 36 Percent!